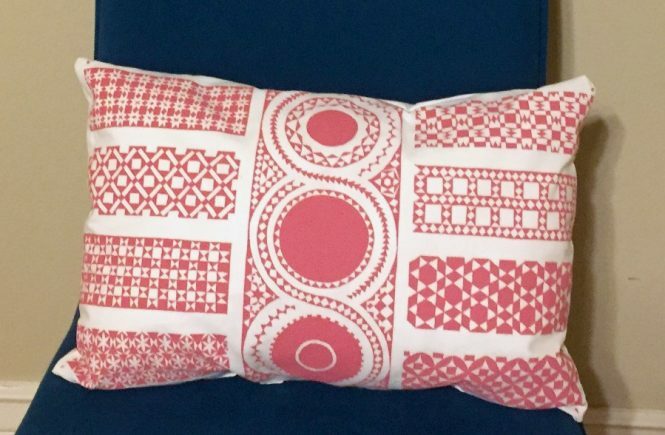 Make a pillow out of placemats or other fabric that’s “too precious” to use. One of our wedding presents was a beautiful set of block-printed placemats. They’re white linen stamped with red geometric patterns. They were a stunning, thoughtful gift from a family I stayed with while I did an internship at a newspaper in Gloucester, Mass., which we passed back through on our honeymoon on the way to Maine. This precious gift from people I loved, people who are both gone now, stayed in the box it came in for 15 years. I was so afraid to mess the placemats up that I barely even took them out of the box all those years. I was sure if we ever used them they’d get stained and I wouldn’t be able to wash them and it would be terrible. I knew this was ridiculous even as it was happening. I thought for years about framing one or two of them. At least that way they could be in the dining room or in my office, being used in a way that wouldn’t get them dirty. I finally decided enough was enough, that I wanted to use them in some way and that it would be OK if they got dirty. I mean, people give us gifts because they want us to use them, right? So I decided to make a pillow out of placemats that could be used in our bedroom or living room to add some much-needed color and a happy memory. Change can start with a placemat pillow. 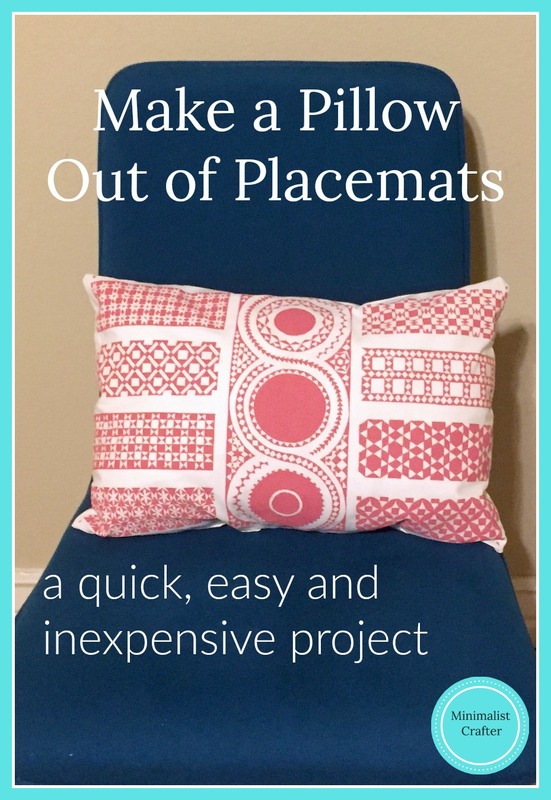 This is a really simple project, and if you don’t have placemats you’ve been hoarding for more than a decade, you can any special fabric you like, cut to a size you want a pillow to be. 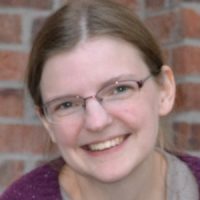 As long as you have Fiber-fil, batting or something else you can stuff a pillow with in the house this should be a project that requires no purchasing of materials at all. How great is that? Use the placemats as a guide to cut the fabric you’re using for the pillow form. I kept mine folded in half along the short side so I had one long rectangle. 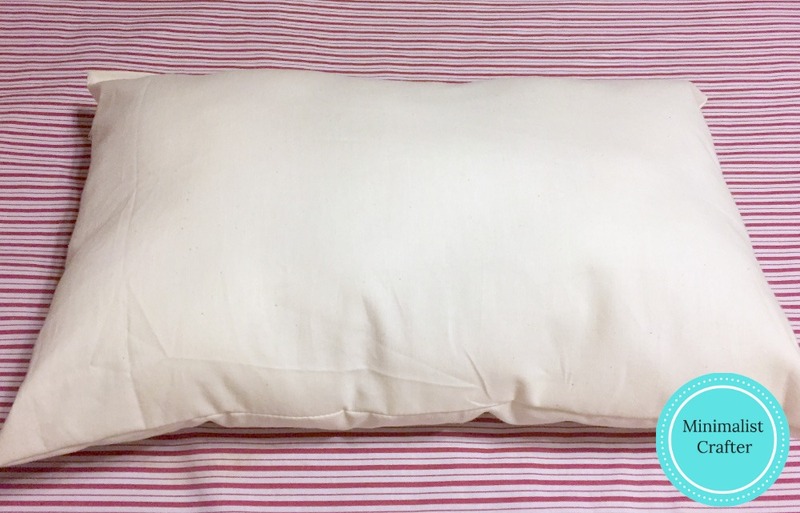 Sew up the sides of the pillow form, leaving a gap of a few inches. Trim the corners as needed, and turn the pillow right side out and stuff as desired. Fold the raw edges of the gap to the inside and sew closed, by hand or by machine. Place the placemats right sides together and sew around the sides, leaving a gap big enough to easily stuff the pillow through. Turn the placemats right side out and put the pillow inside. Sew up the gap using a sewing needle and thread. Put somewhere you will see it every day and it will make you smile. Enjoy the thrill of using things you have and showing off the things that are important to you. Action item: Do you have something you’ve been meaning to use or do something with but it seems scary because you don’t want to mess it up? Stop fretting over the potential for disaster and use the thing. I promise you’ll be glad you did. I’d love to see your finished projects and hear the stories behind them, which you can share on the Minimalist Crafter Facebook page. 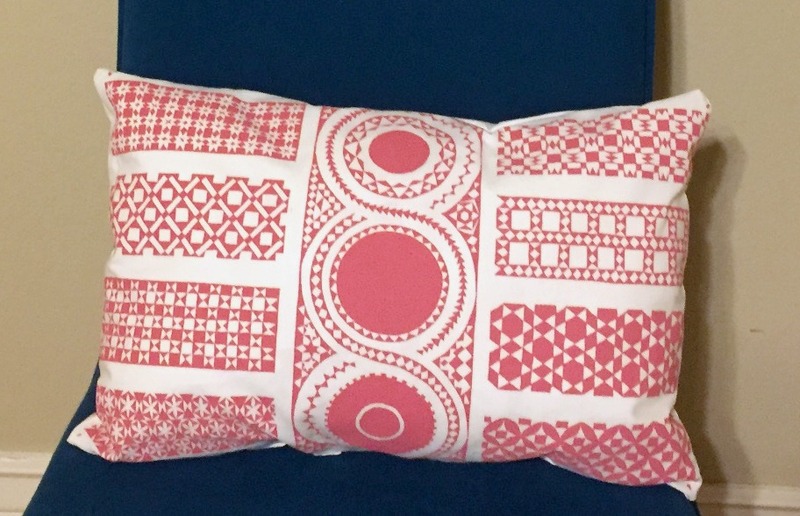 What a fantastic idea – the pillow looks fantastic too! Thanks! It was really fun and easy and I love it. 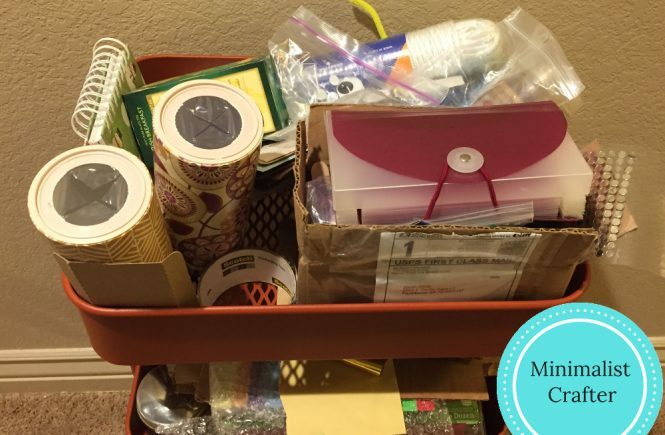 So much better than stuff sitting in a drawer! Thanks for visiting. Thanks! I really love it, too!